— 350 g of flour. — 200 grams of sugar sand. — 130 g of margarine. — 2 tbsp of honey. Need liquid honey. Solid pre-melt in a water bath. — 400 g of sour cream. Take thick. — 0.5 tsp. of baking soda. 1. Mix until smooth the eggs, sugar, honey. If honey is solid, pre-melt it in a water bath and let cool. 2. Pour the sifted flour. 3. Soda off with lemon juice or vinegar. Add to previous components. Knead the dough. 4. Baking pan with high sides smear margarine or misteli parchment paper. Pour the batter and spread it. 5. Bake for 10 minutes. Heat set to 220 degrees. Then cover the pan with foil and continue to bake for another 10 minutes at the same temperature. 6. Next you need to prepare the cream. Mix sour cream with sugar until it is completely dissolved. Can pre-grind the sugar into powder, then it will not have longer to stir. The result is a watery cream for impregnation. 7. The edges of the baked cake cut. Next, cut one thick layer into multiple thin. 8. 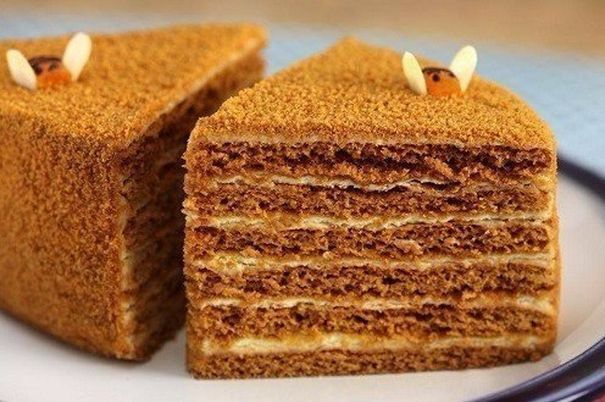 Brush the first cake sour cream, cover with second Korzh. To cook so with all the layers. Put a honey cake in the fridge all night, to impregnate. 9. Cut edge you into crumbs. The edges of the cake smear a little sour cream and stuck to the crumbs. You can also make the cake, sprinkle it with crushed nuts. Now wait 1 hour and you can serve your honey a delicious cake to the table.